TWT established a horizontal (NAD 83-NSRS 2007) and vertical (NAVD 88), geodetic control network by GPS fast static, methods referenced to NGS high-order control points located near the project area identified by the NJ Geodetic Control Survey, for the purpose of low altitude aerial photography targeting within the project limits, as part of the previous Task Order Agreement. This work was coordinated with the NJDOT-Geodetic Survey group. Accuracy for the control network established for this project met or exceeded classification standards for Horizontal Control, Second Order, Class I accuracy and Vertical Control, Second Order, Class I accuracy. The aerial target x,y,z values were then established utilizing RTK-GPS procedures with the vertical values being established by differential leveling methods utilizing a DINI-12 digital level and Invar rods. The project horizontal coordinate system was “scaled to ground” about a centrally located control point within the project limits as the final deliverable. A final Survey Control Report describing the survey methods and final results of the survey data processing was prepared and submitted. Targets for low-altitude (helicopter) aerial photogrammetry were set along the outside shoulders of Route 295 at approximately 600-foot intervals (approximately 215 targets). Approximately 60 additional targets were set along interchange ramps within the proposed mapping limits, as well as another +/-60 additional targets outside of the proposed mapping limits, to cover the entire requested mapping coverage. 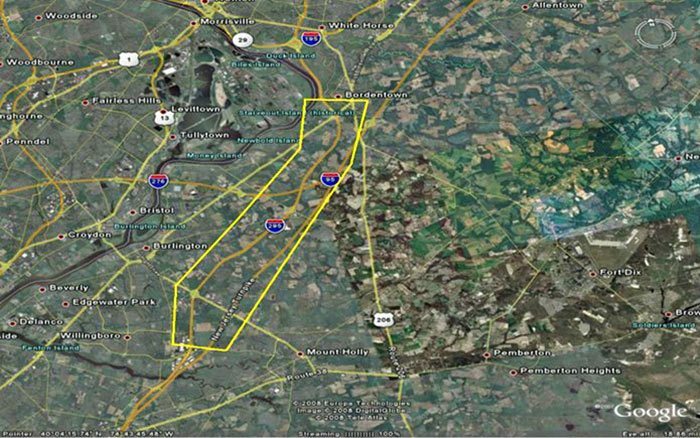 Upon approval of the initial Survey Control Report by NJDOT-Geodetic Survey, coordinates and elevations for all targets were provided to BAE Systems for aerial mapping control. Using photogrammetric control targets, coordinates and elevations as described above and provided by TWT, BAE Systems developed digital planimetric mapping and DTM development for Route 295 within the project limits.